Approx 77cm square ( 30”). Stunning PICASSO artwork with signature. 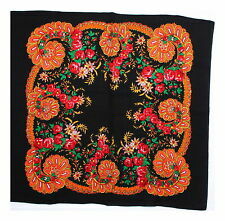 Ladies LARGE SILK scarf in super condition. Approx 88cm square ( 34”). Fabric : Silk. Size : approx: 30" Square. Condition: good. Approx 58cm square ( 2 2”). Approx 77 cmsquare ( 27”). Size : approx: 31" Square. Fabric : Polyester. Size : approx: 34" Square. Fabric : Polyester (soft & silky). Approx 66cm square ( 26”). Rolled edges. Fabric : Polyester. Naturally raw ends. Fabric : Silk. It does have a few condition issues that I have photographed in pictures 8-10 but these do not detract from its wearability. Fabric : Silk. Hand-stitched edges. Size : approx: 32" x 34". Size : approx: 34" Square. Jacquard weave. Type of Silk Very Minor flaws - Insignificant on wearing. Nothing significant. Very Good (with flaw) ✓. 60 x 60 cm. Lovely Max Factor floral chiffon scarf. Le Jardin d’Amour after their perfume. Measures 30inches square. 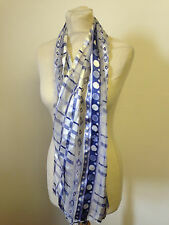 Very stylish scarf in very good condition. 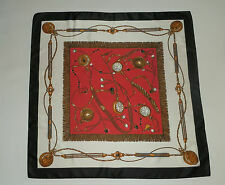 Ladies vintage scarf in luxurious silk. Checks and animals Wear one hundred and one ways. Measurements 34"square Condition- good. Few minor marks . Nothing major. Your beautiful item will come to you carefully wrapped and sent via Royal mail fully insured. On a blue check background. Fabric : Silk. Size : approx: 33" x 34". Fabric : Silk - floaty, raw. Size : approx: 40" Square. HERE IT IS A100 %SILK LONG SCARF. MULTI COLOURED.LABEL FELICIANI. 100% SEIDE=SILK. FRUITS AND FLORAL DESIGN. IN GOOD WORKING CONDITION.SOLD "AS SEEN ". Rolled edges. Size : approx: 32" x 34". Condition- good. Few pulled threads. Sort of like a Picasso design with mixed up faces. The “ Emilio" signature appears throughout the print. Emillio Pucci. Jacquard weave. Type of Silk Hand Roll ✓. Nothing significant ✓. Details: A couple of small threadpulls in one corner (see last photo) - INSIGNIFICANT. Overlocked edges. Size : approx: 34" Square. Fabric : Polyester (soft & silky). Ladies vintage scarf from the 80s. Abstract design in orange copper and yellow tones. Wear one hundred and one ways. Measurements 13" x 62" Condition- good. No marks or holes that I can see. Your beautiful item will come to you carefully wrapped and sent via Royal mail fully insured. Ladies vintage earthy ombre scarf. Sheer fabric. Wear one hundred and one ways. Measurements 21" x 62" Condition- good. Few pulled threads. Your beautiful item will come to you carefully wrapped and sent via Royal mail fully insured. It was A Present To My Mum In Law Many Years Ago From A Friend Who Was Known For Her Luxury Gifts! It Has Tassles. 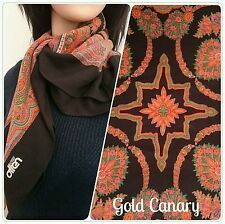 Ladies vintage scarf in luxurious silk. Large sunflower design. Wear one hundred and one ways. Measurements 35"square Condition- good. Few pulled threads and very small holes. Nothing major. Your beautiful item will come to you carefully wrapped and sent via Royal mail fully insured. Triangular head covering. White with green hand silk screen foliage pattern. Very pretty. Could be used as wall decoration. Long side 25", other sides 23". Cotton ties. Unique in that pattern is no longer available. Machine turned edges along the long sides and natural ends. Size : approx: 42" Square. Fabric : Polyester, lightweight with a wide ribbon stripe. Size : approx: 23" Square. Fabric : soft & silky Polyester. Size : approx: 34" Square. Fabric : Polyester. Size : approx: 35" Square. Fabric : Polyester. WOVEN IN ENGLAND. Full length is 64", Width is 9". Fabric : Polyester (floaty & sheer). Machine turned edges.